...Adam announces "I am going to birdie this hole." We both hit great drives (as I recall I beat Adam by a foot or two). After his second shot he was feeling pretty good. "Hmmmm. How bold." I think. "But a spit in the eye of the golf gods." I remind him of Proverbs 16:18. Pictured above is his 3rd shot - an easy chip to the green. Which failed to quite make it to the green. 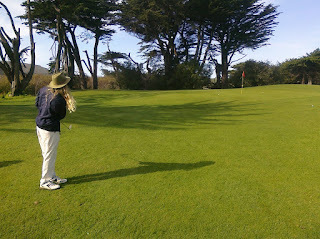 In the meantime, I duffed my 2nd shot but striped the 165 yard third shot to inside 5 feet. FANTASTIC camera work! Congratulations. Oh, and congrats for the bird as well. Adam says he's been making a nightly sacrifice of a sleeve of Titlelists to the golf gods to make up for his transgression. If Adam was sincere in his contrition, he would leave some appropriate comment to that effect on this blog post. I have reason to believe that the golf gods are regular readers of this blog. They have noticed his absence.